We believe in building a safe, inclusive community for all, which is why United Way Peterborough & District is part of the community task force charged with helping welcome 1,000 Syrian refugees to the Peterborough area. United Way partner agency New Canadians Center will be facilitating the creation of the task force, expected to be made up of representatives from Trent University, Fleming College, Peterborough Police, the Peterborough County-City Health Unit, United Way Peterborough and District and the Peterborough Regional Health Centre. In recognition of Women Abuse Prevention Month, Wrapped in Courage invites everyone to purchase a purple Wrapped in Courage scarf in support of local women fleeing abuse. The scarves will be sold throughout November for $15 at the YWCA and United Way Peterborough & District. 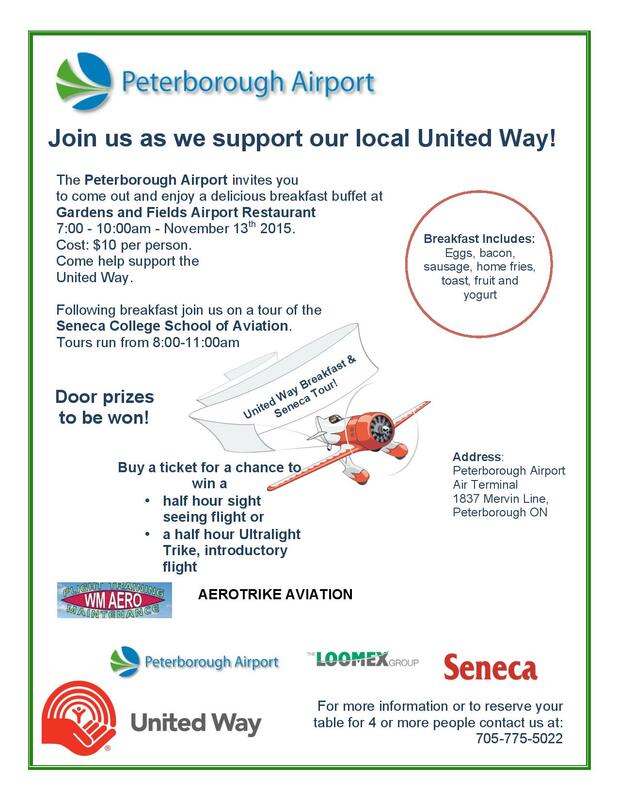 Friday Nov 13, Peterborough Airport hosted breakfast in support of United Way Peterborough & District. Thank you all those who attended and to Peterborough Airport for putting on this great event! On Nov 19th the John Howard Society of Peterborough hosted their annual lasagna lunch as part of their UW workplace campaign. Thanks John Howard Society for a delicious meal!